Our box will have your secrets safe forever under lock and key. Designed in elegant metallic gold print, we have illustrated clever titles and authors to indicate that there is something more to this box than meets the eye. Discover the puzzle to opening the box and you will reveal a compartment that holds a brass key to unlock the cover. The spacious interior is lined in red felt to hold your valued treasures. Made with precision out of walnut wood. A sophisticated and refined gift for anyone with discriminating tastes. Measures 7" long x 5" wide x 3-3/4" tall. Solution included. This is one wooden puzzle box you will treasure forever. Reminiscent of an old banded pirate chest, it can be opened in multiple moves. Exquisitely crafted of maple and walnut woods. Measures 6" x 2-1/2" x 4". Solution included. Developed for us alone. A simple movement is the solution to open this elegant box. Made of ash wood, it is an exceptional showpiece. Measures 4" x 4" x 3-1/2". Solution Included. 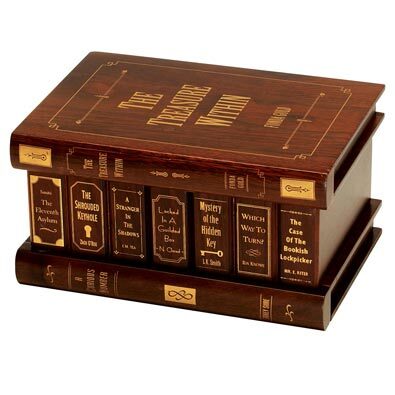 Store your most treasured keepsakes in the secret compartment of this handcrafted rosewood puzzle box. Once you have unlocked the mystery of the box, do not give anyone else the "key" to opening it! This item measures 2-1/2" x 5-3/4" x 2-3/4".